Yaxley looking sporty in his matriculation cape. He wears it well. More later on the ceremony. But today I'm gonna be busy hugging Micron and Jager. I agree, blue is his color! Looking forward to reading about the matriculation ceremony. But I'll need a moment to make sure I have enough tissues close by! It was a long day, last Saturday. But an amazing one. Our region packed in a workshop along with the grad ceremony. And we were able to catch up with several old friends. So some happy tears for us along with the sad. Sooooo handsome! 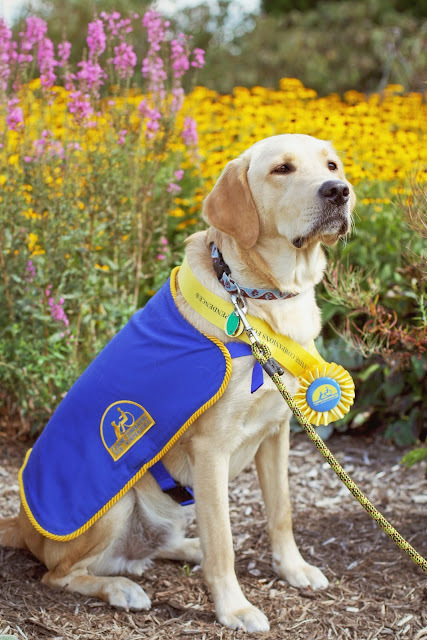 Thinking about you and all the puppy raisers who turned in this weekend! Thanks Hannah, there sure were a lot of us, too. We had 27 at the North Central Region. Not sure yet about the other regions. Wow, what a handsome looking boy. Look forward to hearing about the ceremony. I so admire and respect you folks that work with these wonderful dogs. THANK YOU!! Thank you so much Val. I can't speak for the other puppy raisers, of course, but for me I have to admit it's not completely altruistic. I absolutely love this volunteer work. It gives me such joy to spend my life with these awesome creatures. I can't imagine life without a leash in my hand.